Jordan Peele has had one of the most successful genre transitions of any creative individual. Despite starting out as a comedian in a duo with Keegan Michael-Key, he has moved to writing/directing/producing far more serious content. His debut feature, Get Out, was a fantastic piece of horror entertainment with great racial commentary. His next film is not a sequel, but another horror that manages to be a creepy and entertaining success. The Wilsons, consisting of Adelaide (Lupita Nyong’o), Gabe (Winston Duke) and children Zora and Jason move into a vacation home in Santa Cruz where Adelaide lived as a child. Adelaide is suffering from PTSD due to a traumatic childhood event and notices signs of the situation happening again. Before she can do anything, the family is attacked and taken hostage by clones of themselves, known as “The Tethered”. They invade the house and take the Wilsons hostage, who then must fight their way out. Comparing Get Out to Us is hard as they are both very different films. The main difference is that whilst Get Out had one very obvious message, Us is a lot more open to interpretation and has many different potential readings. Although Us could have been a classic case of Sophomore Slump by being either too messy or too simple, Peele manages to blend simplicity and complexity. The story is incredibly straightforward, yet there is also a lot of depth to the narrative and themes. The narrative is clearly tied to a set structure yet is also extremely unpredictable. The scares are blunt, but the film has no forced jump scares. Finally, though the film is certainly crowd-pleasing, it is also rather weird and will not leave you in a state of relief. In general, the plot is ruthlessly economic and reliant on foreshadowing, reincorporation and symbolism, as well as containing a lot of cultural references. Despite Get Out having a superior screenplay, Us showcases that Peele is still a great writer. What also sells the story is the acting, especially because many of the actors must play both protagonists and antagonists. Lupita Nyong’o manages to play both a troubled heroine and an insanely disturbing raspy voiced villain. Winston Duke continues to be a great rising actor and is the most charismatic and likeable family member. Evan Alex and Shahadi Wright Joseph as the children are also fantastic, particularly Alex, who gives quite a physically demanding turn. But the best aspect is Jordan Peele’s direction; the one clear improvement from Get Out. Right from the start, Us has a creepy atmosphere created through a lack of dialogue and heightened by Mike Gioukolas’s mesmerizing cinematography. Every shot is perfect in terms of lighting and framing, with the relatively low $20 million budget not being noticeable at all. The soundtrack is used to great effect, with “I Got 5 On It” being successfully made creepy and the opening credits having a theme that tops Sikiliza Kwa Wahenga. The minor issues with the film are two-fold. One, Elisabeth Moss and Tim Heidecker’s roles as the Wilson’s friends are somewhat thankless and a setpiece involving them, though intense, is the closest thing to filler in an otherwise tight script. Two, though the central family are both likeable and characterised, the story could have spent 10 more minutes fleshing them out and giving the audience more of a connection with them. 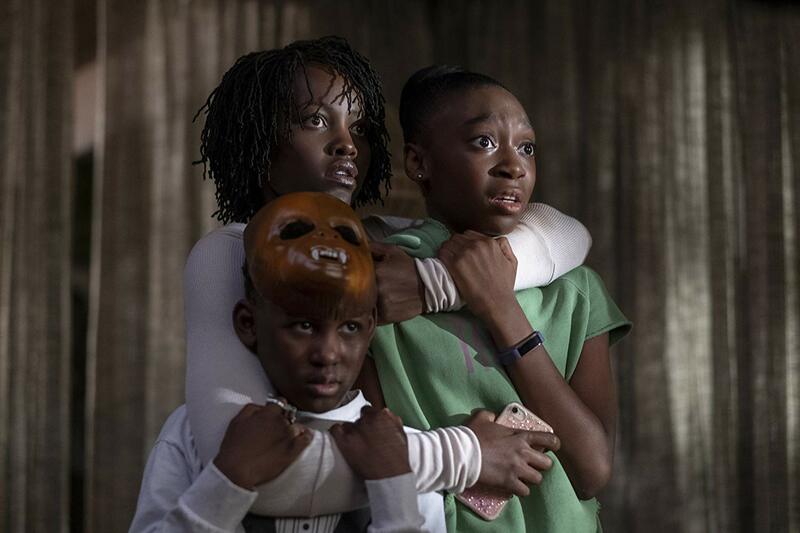 Us is further proof that Jordan Peele is giving horror the originality and sense of style that it currently needs. It’s a creative, scary and thrilling film that will probably provoke discussion. If this review sounds vague, it is because the film itself is, but trust me when I say that that is not a handicap. If Peele keeps this quality and track record up, then he might be the next great horror director.